JUNE 24, 2015, KINGS BAY, Ga. (NNS) – With the release of NAVADMIN 142/15 “FY16 Enlisted Women in Submarines Selections”, the first group of enlisted female Sailors from across the Navy has been chosen to serve in the U.S. Navy’s submarine force. Rear Adm. Charles “Chas” Richard, commander, Submarine Group 10 and Enlisted Women in Submarines Task Force Commander, said the interest to apply was impressive. 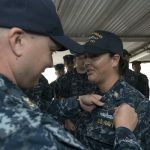 A strong response fleetwide was received in the call for enlisted female Sailors applying for conversion into submarine force ratings. Applications from women representing 31 different ratings from shore and sea commands worldwide were received for the initial application period to fill four chief petty officer (E7 paygrade) and 34 rating conversion positions in the paygrades of E6 and below across the two crews of the USS Michigan (SSGN 727). Michigan is one of the Navy’s Ohio-class guided-submarines homeported in Bangor, Washington. Based on the number of applications, the selection process was competitive and used an objective review and scoring of each application. Selections were made based on the Sailor’s performance in their current rating, the Sailor’s desired submarine rating assignment, the needs of the ship to fill billets of planned rotations where appropriate, and lastly the needs of the Navy for rating community health, both in the old and new ratings. Applications were scored on performance evaluations, warfare qualifications, commanding officer endorsements, sea service time, physical readiness testing, and similarity of current rating to desired submarine rating. With the Sailors having been identified, they will now undergo the standard submarine medical screening process. After they have cleared medical screening, they will begin the training pipeline with Basic Enlisted Submarine School (BESS) in Groton, Connecticut. 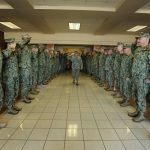 Sailors who applied to change ratings will also be provided the technical training through “A” schools and possibly “C” schools to prepare them for their new assignment.